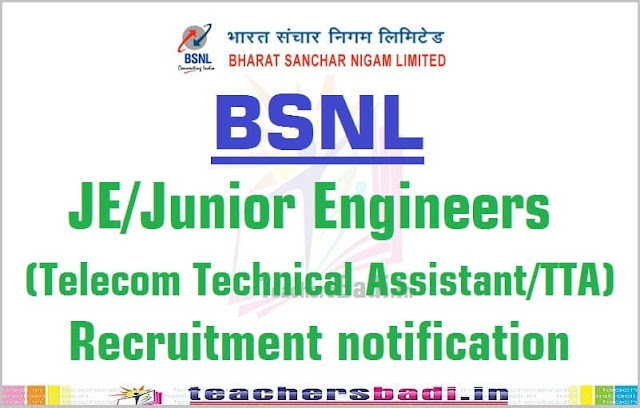 BSNL Junior Engineers(TTA) Recruitment 2016 notification: BSNL has published the Junior Engineers(TTA) Recruitment 2016 notification and applications are invited from the eligible candidates for recruitment of 2700 Telecom Technical Assistant (TTA) Posts. Bharat Sanchar Nigam Ltd. (BSNL) will conduct ONLINE EXAMINATION for filling up total about 2700 posts of JUNIOR ENGINEER (JE), (erstwhile TIA). All candidates fulfilling the prescribed eligibility conditions and possessing qualification as detailed in Annexure-A herewith will be eligible to apply for the above said post. BSNL Junior Engineers(TTA) Recruitment 2016 online application form, last date for apply online, recruitment examination date, how to apply, JE post details, selection procedure details given here. The Junior Engineer (JE) (erstwhile TTA,) shall be appointed in the IDA pay scale Non• Executive-9 [NE-9] of · 13,600 - 25,420/- with annual increment @ 3% of basic pay plus IDA, HRA, Perks, Medical Benefits, etc. admissible as per BSNL Company rules. Only Indian Nationals would be eligible to apply. Applicant must possess the educational qualifications as given in Annexure-A, on the closing date of application for Junior Engineer (erstwhile TTA), Exam in BSNL. Candidate shall not be below 18 years and not exceed 30 years as on the last date of receipt of Online applications from the candidates (as on 10th August, 2016). However, the upper age limit is relaxable as per the standing instructions of Government of India. Territorial Circles along with their respective headquarters etc., appears in Annexure 'B'. The Junior Engineer (JE) is a Circle-based Cadre and the candidates would be selected against the vacancies of a particular Circle. The first posting of the candidate shall be in the rural areas of the Circle for the minimum period of 5 (five) years. BSNL has the right to post any selected Junior Engineer (JE) to any of the Circles either temporarily or on permanent basis. The decision of BSNL in this regard shall be final and binding. The service conditions, seniority etc. of selected candidates will be determined as per prevailing rules of the Company from time to time. The willing candidates shall have to give option for only one Circle, in which he/she desires to serve, consequent upon his/her selection. Option once exercised shall be final and under no circumstances, it will be changed. Duration: 3 hours :: 10.00A.M. to 1.00 P.M.
Online Application and Fee for examination: Candidates applying for Junior Engineer (JE) posts are required to apply online for which link shall be provided through BSNL web site www.externalexam.bsnl.co.in. Applications will be considered only through the online registration process which is to start from 10-07-2016 and will be closed on 10-08-2016. Therefore, candidates are advised to visit our web site (www.bsnl.co.in) for any updates regarding Examination. All candidates applying for Junior Engineer (JE) posts are required to read all the instructions provided on website www.externalexam.bsnl.co.in before filling the online application form. candidates will have to provide valid Email ID and Mobile Number at the time of online Registration. The prescribed examination fee Rs. 1000/- (Rupees One Thousand only) for OC/OBC candidates and Rs. 500/- (Rupees Five Hundred only) for SC/ST candidates shall be paid through online mode i.e. Internet Banking, Credit Card, Debit Card only. The amount of the fee shall not be accepted in any other form. Fee once paid shall NOT be refunded under any circumstances nor can be held in reserve for any other examination or selection or otherwise. Hence, the candidates are requested to ensure their eligibilityfor this Direct Recruitment of Junior Engineer examination before applying for the same.